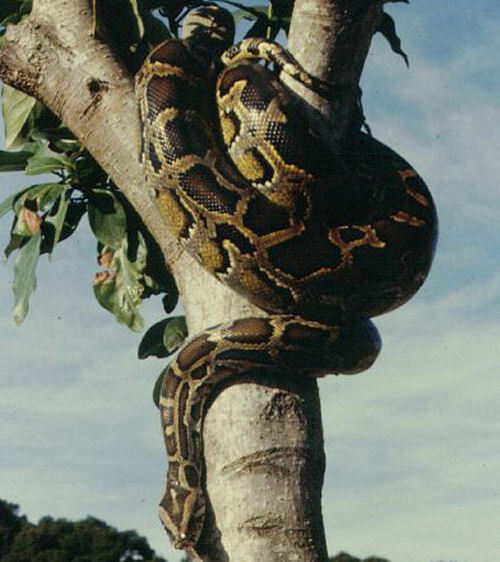 The Indian Python is a giant among snakes. It’s also known as the black-tailed python, Indian rock python, its Latin name being Python molurus. Although not venomous, these snakes are highly dangerous, and their hunting technique relies on twisting around the prey and choking it to death, by straining the muscles. Indian Pythons are truly gigantic, reaching up to 8 metres in length and 120 kg in weight. 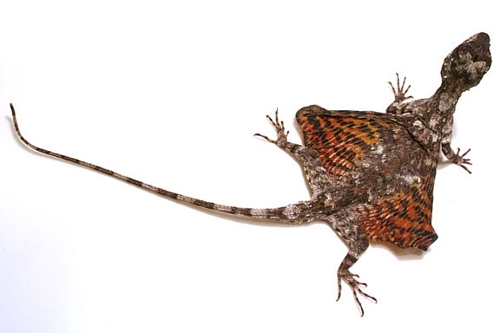 They’re coloured white to yellow, with gray to dark brown patterns all over the body. 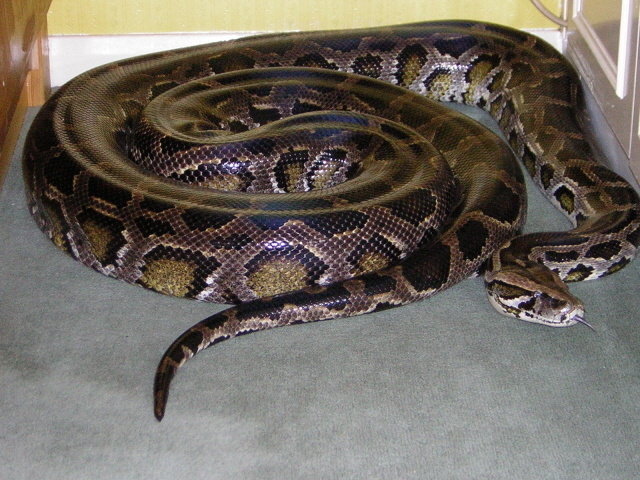 The python inhabits South Asia, from Pakistan through India and Sri Lanka, up to South China, Malaysia and Indonesia. These snakes lead solitary lives and they hunt mostly during the night, while spending the day warming in the sun or resting in a cave or a tree cavity. They spend very much time in the trees, which prove to be great places to set up an ambush. Indian Python relies on its great sense of smell to track prey, constantly slipping the tongue out to register a variety of smells in the air. As most snakes, they also have thermoreceptors, that enable the snake to notice even the tiniest change in the temperature of the surroundings. Although the Indian Python may seem as a relentless hunter, the total prey eaten per year is only about of the same weight as the snake, which is usually less than 100 kg. They feed mostly on mammals. At night, the snake first finds the animal’s footmarks and then follows it through the jungle. The thermoreceptors allow the snake to “see” the animal’s movement from more than 1 meter away, even if it’s pitch black night. When ready, the python swiftly jumps on the prey and twists the massive body around it, and then uses the strong muscles to choke the animal. When the prey is dead, the python swallows it whole, and as the hunted animals are often fairly large in size, the python can live for multiple months without eating after that. The snake’s incredible hunting capabilities are shown by the fact that there has been a case when leopard remains were found in the stomach of an Indian Python. During the mating period, males find partners by a special scent the female produces. After copulation, they separate again and go back to living solitary lives. Three to four months later, the female finds a proper place for a nest and lays up to 100 eggs. The female keeps the eggs warm by curving around them. After 55-80 days, the eggs hatch into fully developed snakes that immediately start hunting and living on their own. Throughout time, these gigantic snakes have been hunted for their beautiful skin. For obvious reasons, they’re also not welcome guests in human populated areas and a number of Indian Pythons are killed just because people fear them. Currently, the number of Indian Pythons present is reducing and they’re a highly endangered species.